Took lunch on Broad St. Parked in the middle of the bridge. Quickly sighted Beauty on OCSR. Around 12:18, Beauty pretty directly flew to the nestbox. It is interesting to note that her approaches tend to involve fairly angled up-lifts. From OCSR, she disappeared behind Reuters Publishing, but when I next saw her, she was centered up on Times Square at about the 8th floor, and to my way of thinking pretty close to the face of the building. That was when she swooped up his angle and landed right at the nextbox. In she went and out came Archer. He headed out behind Reuters, and when I did not see him land on OCSR or Mercury, I changed position to check the Wilder Bldg, which is where I found him on the copper ledge. He preened a bit, and then headed over to the base of Mercury, disappearing from view again. I watched for a stoop over the parking lot for a bit, but it was time to head back to the office. Getting back to my car, I was able to see Archer still on Mercury. Next thing he was off and headed towards me. He flew overhead and out over the river, circling by the library twice. I did not see what had him so interested, but he was not more than 20 or 30 feet above street level. He came back over Broad St, circled and headed up Broad, past South Ave and over the ramp garage. Again I lost sight, but I stayed put. Within 10 minutes, I had him coming back up Broad St. As he flew overhead I could see that he had completed a hunt. I don’t know what he caught (but it wasn’t anything big like a Condor or flamingo or elephant). Archerwent to the south-east wing on TS and started cleaning. It was time for me to go. Nice watch on a cold, and somewhat cloudy day. On what turned out to be a beautiful day, Cleo the Catahoula Leopard falcon-watcher-in-training and I headed to the Broad St bridge. Getting there, I found Lou, Dana and Carol P actively engaged in the pleasure of falcon watching. It was a pretty good watch. We had Archer in 2 stoops from the OCSR. The first one took Archer way out over the river, headed south - way beyond Court St. We got a look at the target and it appeared to be a hawk, but as I said it was pretty far out. Archer cranked the wings all the way until he got close when he went into a 45 degree descent after the hawk. We lost sight of him, but he showed up again. Later on while we were in the Thompson parking lot, Archer did a vertical stoop from OCSR down the southeast face. Unfortunately the buildings got in the way and we lost sight of him about half-way down. It was a glorious stoop, and something I had not seen since the Kodak days. He went right down the face of the building. It is always amazing to me how they can pull out before hitting the ground. We had one other burst of activity. Archer was flying around the parking lot going behind buildings and appearing again over our heads. Best guess is that he was spending time and gaining altitude to get back to OCSR. Pretty good day for falcon-watching. I spent a few hours watching Archer and Beauty on Sunday. It was a beautiful, sunny day and they were quite active. Twice on Sunday, Archer hunted successfully and brought in food for Beauty while she remained at the nestbox guarding the eggs. 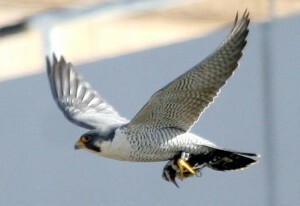 The first time Archer brought in prey and prepared it on top of the Times Square bldg. When he finished, Archer flew down to the nestbox and Beauty accepted his offer. She flew over to the Wilder Bldg across the street to enjoy her meal while Archer remained at the nestbox. The 2nd time was early afternoon. 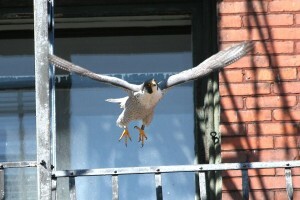 Archer flew in with prey and landed on top of the Times Square bldg, this time at the NW wing. Archer had barely landed when a very vocal Beauty flew out of the nestbox and landed next to him. Well, you can see what happened in this video. I apologize for the jumpiness of the video. My next camera will have image stabilization. We had a beautiful day for a Falcon Watch today. Quite a few people showed up to enjoy the nice weather and sunshine. Watchers included Dana, Carol P, Kathy O, Joyce, Brian, Dawn, Larry O, Jeanne, new watchers Dave and Diane, and myself. As far as falcon watch activitiy, there really wasn’t that much happening in the morning (Dana and I got there around 9:00 am) - we had one spotted on top of Times Square that pretty much stayed there most of the morning. The Rochester city crew was out on the Main Street bridge removing the log-jam of trees and debris in the Genesee River at the bridge, providing us with some non-falcon related entertainment. I have some pics in the attached album showing how they used a large crane to pull trees up onto the bridge where they sawed them into smaller sizes and loaded them into trucks for removal. Some of the trees they pulled out of the river were 80’ monsters. They only did about a third of the logjam so my guess is that they’ll be out again tomorrow morning, weather dependent. As more people showed up, we had one falcon fly near Xerox before it returned to Times Square. We also had a Kestrel visitor that Archer chased. The Kestrel landed on a fire escape across from the nestbox and we think it may have escaped into the building through an open window after Archer flew down to him. Eventually, Archer gave up and flew back up to Times Square. We left in the afternoon with Archer on top of Times Square near the wings and Beauty on the ledge of the nestbox. Sorry it took so long to post this but I’ve had a busy few days. I got a couple of chances to get out and watch the falcons over the holiday weekend. Here’s the first of two falcon watches, this one from Good Friday. Dana, Carol P and myself spent the morning out on the Broad Street Bridge watching Beauty and Archer. We had a few interesting observations, including seeing A & B copulate on Mercury’s moneybag and seeing Archer catch a Woodpecker. We saw a couple of other falcons too, including a Kestrel and a juvenile Peregrine. Non-falcon sightings include a drake Merganser, the discovery of a secret Pigeon hide-out, and an evil Green-Garbed Gnome peering out of the Reuters building, giving Carol the heebie jeebies. To me, the highlight was seeing Archer catch the Woodpecker. It was the first time I’ve seen a falcon actually catch a bird like that and Archer made it look effortless. He easily snatched the bird out of the air near the Convention Center after chasing it horizontally across the river. I have some pictures in the attached album (click on the pic)… it looks to be a Yellow Bellied Sapsucker that he caught. It was another very warm, beautiful day in Rochester, NY, temps in the 80’s (F). I headed downtown for a morning Watch. Beauty was on the Mercury statue’s outstretched hand (which holds what appears to be a bag of coin/gold). Archer was on top of Xerox near the NW corner. Soon after I parked my car on the Broad St. Bridge, Dana and Lou joined me. Archer and Beauty flew around the area landing on different buildings, including the nest box on the Times Square Bldg. At one point, Archer chased a small bird over the river (Genesee River), successfully catching it over the RG&E building on the east side of the river. He carried it to the communication tower just south of the Times Square Bldg. Beauty was inside the nest box at this time. After awhile, Beauty flew out of the nest box and landed, once again, on Mercury’s hand. Her tail lifted and I quickly switched my camera to video, focused it on Beauty and waited. I wasn’t disappointed. Dana, Lou and I witnessed Archer and Beauty copulating on top of the Mercury statue. Here’s the link to my video posted in YouTube. We walked back to our cars and were joined by MAK. We talked for awhile and saw Beauty and Archer fly up to the Times Square building. Beauty landed under the NE Wing and Archer under the SE Wing. Beauty had food and feathers were flying. The temps were rising and by 11:30 am, it was time to leave. I came back for an hour between 5:00 - 6:00 pm, joining fellow Watchers, Joyce, Brian H, Dana, Lou and Marcia. Beauty was preening and dozing on top of the Times Square building and Archer flew in to land on the top I-Beam of the old Changing Scenes Restaurant (OCSR) aka First Federal building. Beauty flew off of the Times Square building and landed on the south end of the Cross Rds building. Archer took off and copulated with Beauty. He returned to his spot on the OCSR and Beauty remained where she was. It was time for me to head home with plans to return early Easter Sunday morning. 7:00 Cleo (my new Catahoula Leopard dog) and I arrived at the Broad St bridge with coffee, doughnut and binoculars in hand. Following the rules of being a good alpha, Cleo did not get access to the coffee or doughnut, but I gave her unlimited viewing thru the binoculars. We quickly spied Beauty on Mercury but no sign of Archer. 7:10 While walking up Court St towards the Civic Center, and having just stepped off the bridge, I saw Archer flying in from the west over the Civic Center Plaza. As he crossed over Exchange St, he went over the War Memorial and I lost sight of him. Cleo and I scooted back to the Court St bridge but did not see him. Beauty however was still on Mercury. So we headed up the War Memorial parkway to Broad St to return to our starting observation point. 7:20 On the Broad St bridge and looking for Archer, I caught him again coming up Broad St towards Xerox. He passed over head e-chupping. Meanwhile, Beauty flew from Mercury to the scrape. Once again Archer went behind buildings and I lost sight of him. 7:30 Continuing to look, I saw Archer kiting on the wind over Lincoln First. He stayed there several minutes and then began a drift over to Xerox. Somewhere between Xerox and B&L, he kited again. Keeping an eye on him, as I was sure that he was hunting, he started his run. He began with about a 20 degree descent towards Main St with his wings still out. He continued the pace until he pulled his wings in which is when he stooped in earnest. He rocket-speed drop took him behind the Hyatt. He must have increased his angle of attack because I did not see him come out the other side, and I should have. 7:40 Archer showed up at the scrape where he landed just under the southeast wing. He stayed a minute and then took off. Now I clearly saw him with a package. 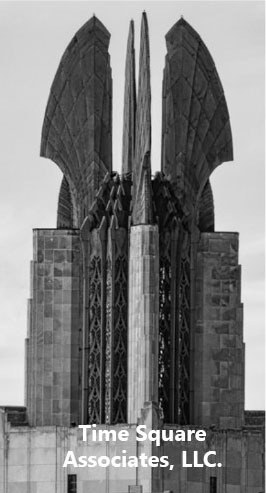 He headed over to the elevator shaft where he flew in, cached the package and came back out, flying around to the other side. 7:50 Cleo and I drove over to Andrews St and quickly located Archer on the top i-beam. We left him there to return home for some breakfast.